To air dry or to machine dry? That is the question. While so many people put emphasis on the clothes washing process, you can’t forget about the drying process either. After all, how you elect to dry certain garments can have a big impact on them moving forward. If you recall that episode of Seinfeld where George put the New York Yankees in cotton uniforms, then you know what we mean. If you’re concerned about wear and tear on your clothes, go with air drying. Since there’s no tumbling process involved, it’s easy on your clothing. Hate ironing? 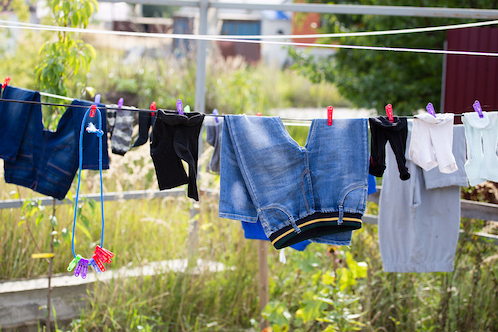 As long as your clothes are hung properly, they’re likely to dry without wrinkles. If you’re a regular air dryer, be sure to add a liquid fabric softener when you’re washing. This helps reduce any stiffness that may be present with air-dried clothes. Be careful with temperature. Generally speaking, you should only be drying clothing items such as jeans, towels and other heavy fabrics on high heat settings. For delicate items, use a low heat setting. For synthetics, go with medium heat. Never overload the dryer. Not only will doing so increase overall drying time, but it will also increase the number of wrinkles present in your dried clothes. Don’t forget to clean out the lint trap. When lint builds up in the dryer, the potential for fire increases. Be sure to regularly clean out the lint trap after every load and have the dryer vent vacuumed every two to three years to avoid excessive buildup. Hang clothes promptly after they come out of the dryer to avoid wrinkles.